Lake Michigan creates magical ice formations at Cave Point County Park each winter in Door County, Wisconsin. A Door County Nature of Romance package is the perfect way to renew your spirit and reconnect with your partner and with nature. In Door County, Wisconsin, the spirit of Valentine’s Day lasts all winter long. Now through the end of March, Door County offers couples a chance to escape into the pampering luxury and scenic beauty of Wisconsin’s peninsular jewel with twenty-eight specially priced romantic getaway packages for two. Each of these Door County Nature of Romance packages includes two nights’ lodging at one of Door County’s renowned resorts, inns, B&Bs and more. Choose from among accommodations that include in-room fireplaces, four-poster canopied beds, water views, whirlpool tubs and indoor swimming pools. Packages, which are value-priced for the winter season on the peninsula, also include romantic dinners or cozy breakfasts, and distinctive touches such as horse-drawn sleigh rides, massages, flowers, champagne or wine, scented candles, hand-dipped chocolates and more. Every Nature of Romance package is unique, plus each package also includes a $25 Door County gift certificate upon check-in. For those who venture outside their romantic cocoons, a tranquil winter wonderland awaits. Snowshoe, cross-country ski or hike the wooded trails in state and county parks and public natural areas throughout the county. Marvel at nature’s ice sculptures along 300 miles of rugged shoreline. Later, warm up in front of a crackling fire. The bustle of summer and fall are replaced in winter by a quiet, leisurely pace that makes each couple feel as though they have the peninsula to themselves. A Door County Nature of Romance package is the perfect way to renew your spirit and reconnect with your partner and with nature. 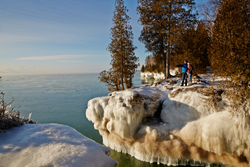 To browse through available Nature of Romance packages, visit http://www.DoorCounty.com. For personal assistance in planning your getaway, call the Door County Visitor Bureau toll free at 800-527-3529.